Our 26-Day Adventure In 13 Minutes!! I’ve (Mike) been given the honor to post the final blog post from this journey. After 26 days, 7500 miles, 16 states, 5 RV parks, and 8 rest areas, we have made it back home. Seldom do expectations ever match reality, but in this case they were surpassed. When planning this trip, as long as two years ago, I had an idea of where I wanted to go and what I wanted to see. Putting it on a map you realize that this great country has so many incredible sites and we had a limited amount of time. Some of where we went was selfish on my part in that I wanted to visit the current running meccas for US distance runners: Boulder, CO, Eugene and Portland, OR and Flagstaff AZ. Routing these towns in a loop allowed us to see some non-running places that really became the highlight of this trip, Crater Lake, Sequoia National Park, the Grand Canyon and Sedona, AZ. Ultimately, though, what made this special was who I went with. We could have picked a totally different route with other great places to see and it still would have been the same because Sonya and I did it together and with, of course, Marley. If you have read our story you know we have been through some things in our lives, past and current. This journey was such a blessing to us. For 2 days we were able to take in God’s incredible creations, refocus on the two of us and recharge for life’s ups and downs surely to come. Finally, I encourage everyone to get out and just do it! None of us knows what the future will bring. We decided the time was now and we were so blessed by the decision. Thanks to you all for taking the journey with us. Our hope is that we made you laugh a bit, awe you a bit by what we saw and inspire you to do the same. I have no real words for this trip except: AWESOME, TERRIFIC, INSPIRING. Most of all I developed an appreciation for what matters most in this life - not stuff, not a career, not accolades but family, love, an appreciation for God's glory and living life with a purpose. Mike (driver, sergent) is truly a blessing from God and I would not have wanted to enjoy what I did without him (even though he does not have a clue about enjoying the road and points of interest). This blog has been great...maybe I will consider a continuation of our adventures as we run through this life together. The most delicious sno-ball ever...not really, just most delicious one for today! Well, today we pulled out of West Monroe, headed for Tallahassee. We enjoyed a great run despite the rolling hills the entire time, with my cousin David and his wife Vicky Lynn. I had so much fun this morning chatting with Vicky Lynn and her friend, that the miles flew by! 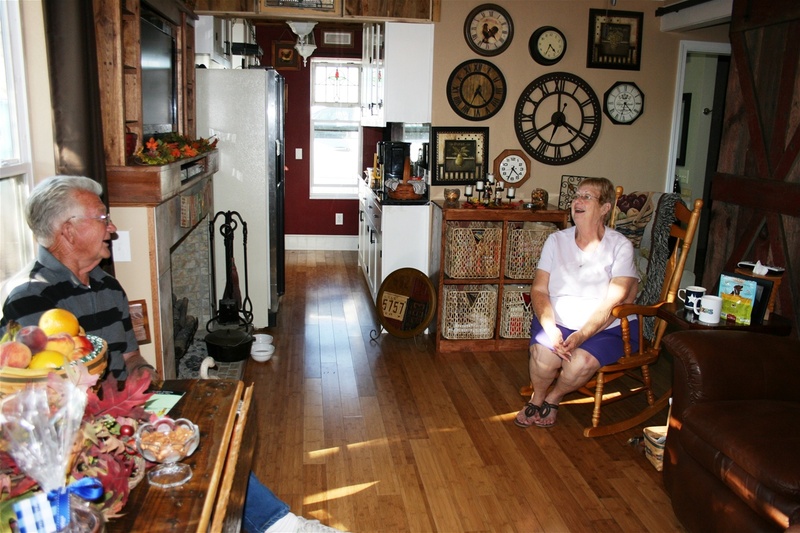 Mom had breakfast waiting for us of biscuits and gravy…my all-time favorite, especially made by mom from scratch! We loaded up the RV and Mom packed us some chicken and dumplings for the road. 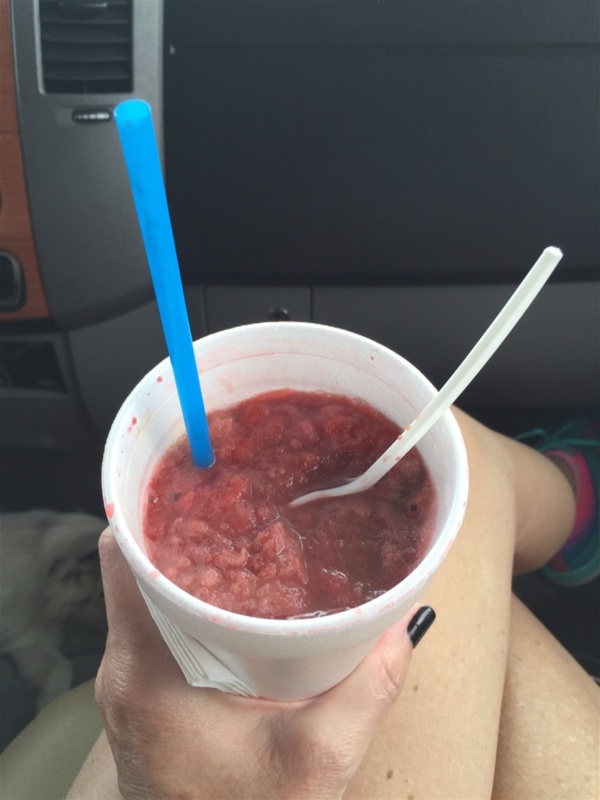 However before we got on the interstate I had to aggressively discuss with my driver the fact that I needed one more sno-ball for the road – it was a shake of the head, muttering under the breath and a huge sigh from the driver, but I left town with a chocolate covered cherry sno-ball! The ride from West Monroe to Tallahassee will make you want to poke your eyes out! It’s completely boring with absolutely no points of interest to attempt to discuss the need to stop. I was bored to tears, so I had to resort to a day of technology (ie online shopping). I have cleared the shelves of Amazon, own a pair of mermaid knee socks, trying a new brand of protein powder and trying a new brand of running socks…there is some very persuasive advertising on FaceBook! And now here we are at our last 4-star rest stop for the trip…sorta has me choked up! I will have the ride tomorrow to really reevaluate the trip, relive all the great moments and decide whether I will be having the same driver next time - The question will be whether I am willing to give up valuable stops at various points of interest. Only one day left and the adventure comes to a close. Mike and Marley playing frisbee in Mom's backyard! So thankful for today…I did nothing! Mom’s house has provided such a day of relaxation (and taking care of dirty laundry). Marley was thrilled to run around and play in the yard! Mike and I ran a few miles this morning…hello humidity, I have missed you! On today’s run as I’m trudging up this mountain of a hill, I decided I never want to see another hill, again. I find myself longing for flat roads and the humidity! Running at higher altitudes with dry air can result in several unattractive and uncomfortable issues: sore throat, very dry skin, burning in your lungs when taking deep breaths and constant snot running out of your nose that you continually wonder, “oh great is my nose bleeding…no, just snot”! We ordered a pizza from Johnny’s (best pizza) for lunch and enjoyed eating and visiting with my Uncle Gary, who only lives a few houses over from my Mom (unfortunately Aunt Nancy was working). Then it was nap time – first nap of the entire trip and it was glorious! Also this no work thing is so amazing, I really could get use to it...one problem, gotta have money in the bank to shop on Amazon and buy cute running skirts! The day ended with a delicious meal of smothered pork chops with fresh squash…my Mom can cook! We then relaxed, watched TV, played with Marley and visited. I’m sure Mom and I will stay up way too late, but who cares, tomorrow is Saturday and I’m once again stuck in the RV with my driver the sergeant for hours on the road as we head toward Tallahassee. "For heaven's sake, mom, I need some grass! I gotta get out of this RV and run." And we are still driving…1200 miles in 2 days! We left Amarillo today, headed for West Monroe. It was a long, long drive. I spent the first half of the drive actively trying to take the life of a fly! I planned, strategized and after about 5 hours finally squashed that pesky fly! Hooray! I then realized we had a second fly! I ate an entire bag of Twizzlers, shopped on Amazon, FaceBooked and had 3 cups of coffee, to only realize we still had about 6 hours to go. We stopped for gas around 12:30 and the sergeant agreed to a 15 minute lunch break! Unfortunately there were really no points of interest on the road today…not that we would have stopped anyway. I mainly passed the time on the second half of the drive wrestling with the second fly – he was going to die! Marley and I did attempt to go back to the bedroom and take a nap, but the roads along our route made it like trying to sleep inside a washing machine! We were bumped and tossed all over that bed! With about an hour left to go, Mike spotted the Bonnie and Clyde Museum! He pointed it out and mockingly pretended to be interested. The cruel things that happen when someone becomes cranky and tired – we did not stop at the museum. We finally arrived in West Monroe…o happy day! Mom had homemade chicken and dumplings ready for us and they were delicious. I then took an amazing bath, in a tub! I haven’t had a bath in 21 days! For a moment you thought about this; yes, I have showered but the RV is not equipped with such special things as a tub! We will spend the next couple of days visiting with my family here. We are back to wonderful humidity and temperatures in the 80’s…cannot wait to be running in the thick air and pouring buckets of sweat! As the trip is winding down, it’s bittersweet. I’ve loved the adventure but I am ready to be back in our home where more than 1 person can be in the kitchen at a time, there is a bathtub and above all, a washer and dryer! We should all sleep well tonight and I will be dreaming of a chocolate sno-ball which I plan to enjoy after the run tomorrow! By the way, I did finally kill that second fly! My beautiful hand-painted ornament that depicts scenes all along Hwy 66...good artistic representation of our time in Flagstaff! Here we are, “on the road again…”! We left Flagstaff this morning on our way back to Florida. Drove through New Mexico which offered some interesting sights and several potential points of interest, but it’s like reliving a bad dream…Mike is focused on reaching Amarillo tonight. I did explain the song says “Amarillo by morning…” so we apparently have plenty of time. My driver continually passed up great stops such as Indian City, Meteor City Trading Post and National Museum of Nuclear Science, clearly not realizing these would make for once-in-a-lifetime memories. So here I am stuck in the RV for hours and hours, passing by potential entertainment, stuck with a package of Twizzlers! The only exciting thing we did was finally stop at Flying J travel station somewhere in New Mexico that shared space with Dairy Queen and a trading post which allowed me a few minutes of browsing in the store and enjoying a treat! There were several items in the store that caught my eye that would be great souvenirs – a stuffed and mounted rattlesnake, a sombrero, or hand-painted Christmas ornament. 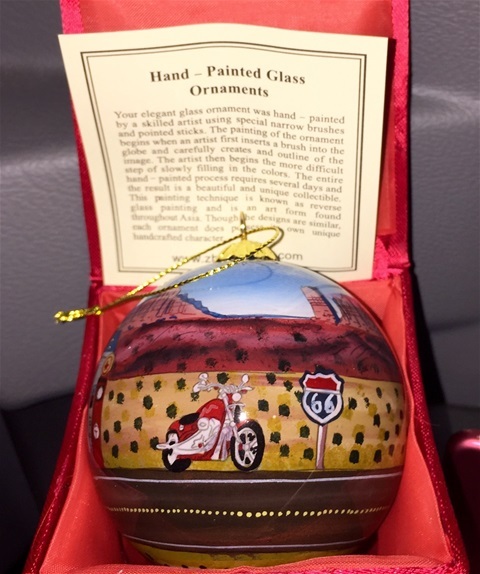 It was a tough decision but I went with the hand-painted ornament, which is quite beautiful and depicts the scenery we experienced in Flagstaff. We have made it to Amarillo (by night) and a wonderful, luxury rest stop. Mike truly does spoil me! The sound of a running generator and semi-trucks coming and going is quite romantic and will lull you right to sleep! Tomorrow should be another exciting day on the road as we head back to West Monroe for a few more days with my family. I’m sure we will pass an abundance of great points of interest and I will be sure to tell you all about the places we didn’t stop! 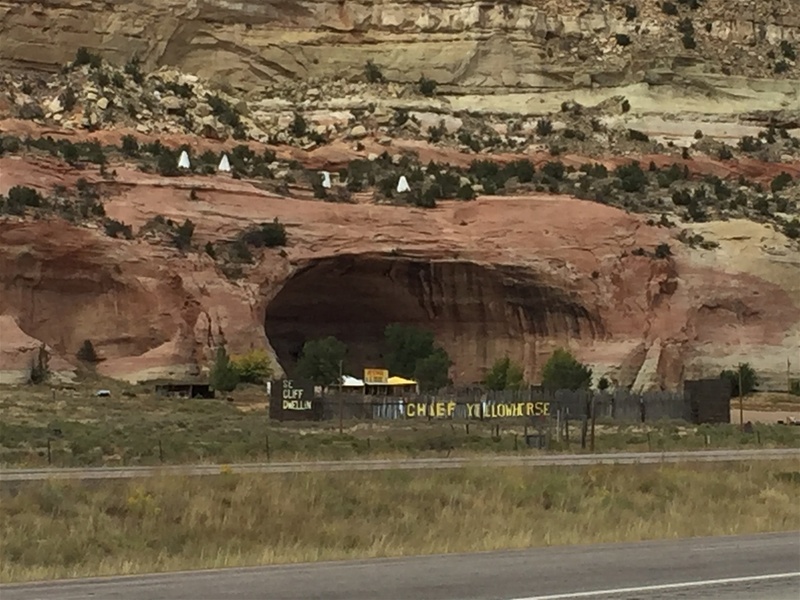 Beautiful scenery entering New Mexico- notice the tepees up on top of the rock! Today was all about Sonya…might be in the top 3 days of the trip! We did our long run this morning on a stretch of road recommended by local runners to be “flat” and great for a longer run! I do believe a Floridian’s definition of flat is very different from the Flagstaff definition of flat! Gracious, it was a long 10 miles, but I finished and the scenery was great along the way, including several road kill items, one being a huge elk! We headed to Sedona today to basically shop and check out the town. My dad decided to join us but almost backed out when he realized it was a “shopping trip”! 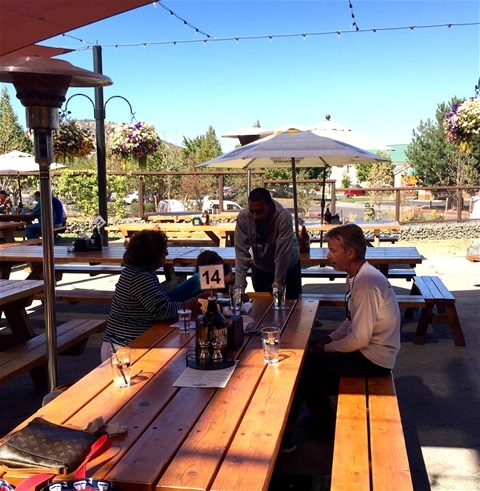 It is a great little town with an eclectic ambiance! There are several different shopping areas, each offering local handmade jewelry, leather goods and lots of artwork including beautiful pottery. They boast being home to several talented artists which can be solidified once you walk through some of the jewelry and art galleries. 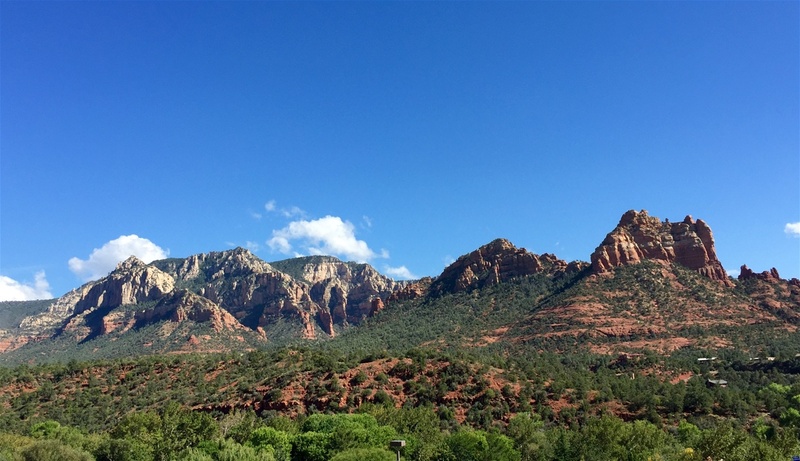 We had lunch outside overlooking a scenic area of Sedona, however pretty much anywhere you go in Sedona offers amazing views! After lunch, I happened upon a great little shop that offered aromatherapy massages, specializing in foot reflexology. It was the pot of gold at the end of the rainbow! My legs were a wreck after running hills, hiking Grand Canyon and then this morning running on the “flat” road (meaning flat as you steadily climb uphill)! I inquired about an appointment for a massage and I am pretty sure they noted the tone of desperation in my voice and it tugged at their heart strings! Mike and I were able to get an appointment right then! Dad was happy to just meander around, talking to strangers while we had a massage. For the next hour I lay drooling on myself as I enjoyed one of the best legs massages ever that included use of an aromatherapy oil that was meant to soothe sore muscles. With jello legs, we headed back to Flagstaff to enjoy one more evening with my family. We ended the night with pecan pie, coffee and a card game! My uncle loaded me up with fresh vegetables from his garden; we hugged and said our goodbyes. In a perfect world all my relatives would live within a one hour radius of us…God really blessed me with an amazing family with hearts full of love and kindness! What a great way to end the trip. Tomorrow we begin the trek back home, with first stop being Amarillo tonight. I can say it will be a quiet, somber ride home…I’m so not ready to return to reality. The next few days will be mostly driving for hours and hours and hours…good thing I have lots of things to talk about so Mike doesn’t get too bored! Our view from the restaraunt balcony as we enjoyed lunch! Mike was very brave for this photo! Today was impressive! 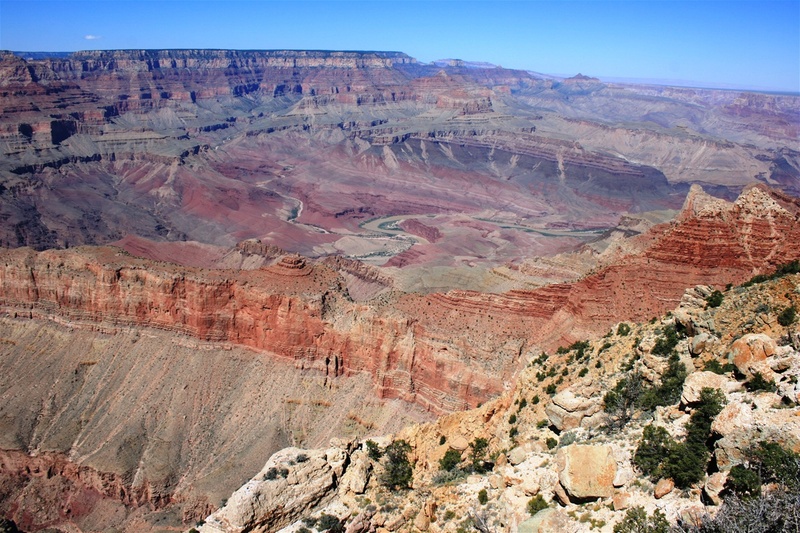 The Grand Canyon cannot be described or accurately depicted in photographs…it’s truly an amazing creation! The day started with Mike going for a short run. I chose not to run this morning because simply, I didn’t want to. It’s cold in the mornings and I prefer the comfy, cozy bed and coffee. After the run we took Marley to a doggie retreat for the next couple of days! 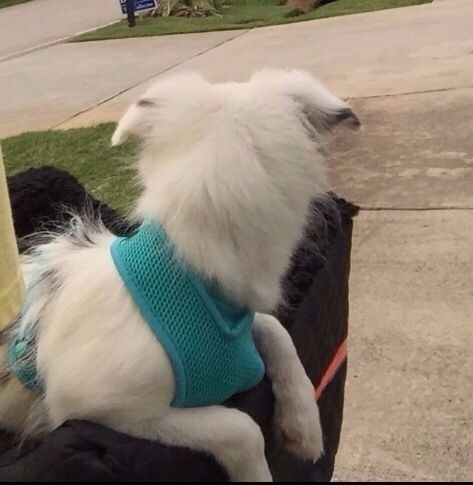 As soon as we walked in the door and he saw other dogs his tail was going 100 miles per hour – he was so excited, but then became unexcited that we were not staying to play too! I cried a little inside. We then headed to the Grand Canyon. The views along the way were beautiful, of course and there were several opportunities to purchase local American Indian crafts and jewelry along the roadside as we approached the park. 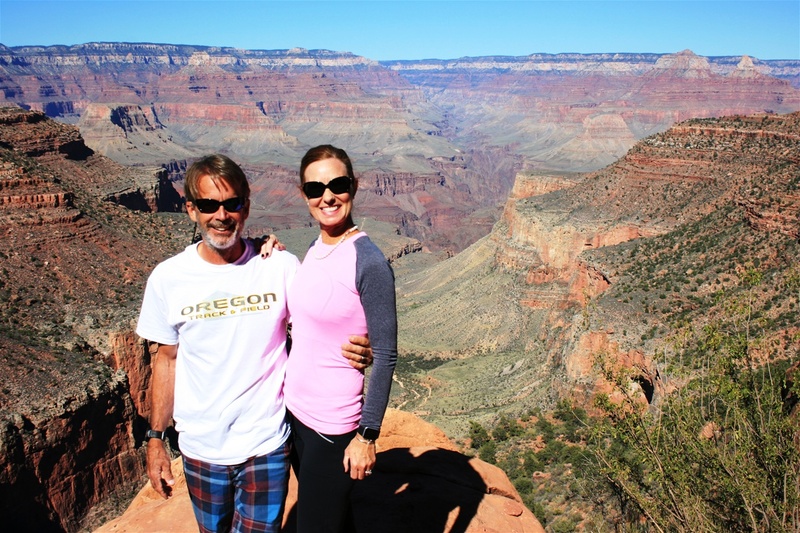 We did not take advantage of these wonderful items and deals given the extreme anticipation and excitement to reach the Grand Canyon. We were given advice from my cousin, Amy to take the Bright Angel Trail which had several mileage options, so we chose the 3 mile round trip hike. Seemed simple, but would provide great views of the canyon. As we started down the canyon, Mike was a little hesitant and unsure he could even progress forward due to his extreme fear of heights. A family in front of us lost the mom due to the heights fear, so I suggested she take Mike back with her and I would join her family – obviously Mike mustered up the courage and decided to be brave. As we were walking down, others were passing us going back up and looked as though they were suffering from a mild cardiac arrest. Everyone was short of breath, sweaty, tired and stopping to rest every 10 feet or so. This troubled me slightly because so far I felt great, but was concerned about what was ahead. We successfully reached the bottom and the 1.5 mile marker where there were restrooms, water AND box with phone to dial 911! Hmmmm…seems a bit serious and scary! So now we head back up the canyon. After about ½ mile up it becomes crystal clear why there was a box for 911 and the throngs of people appearing to be in mild respiratory distress! The climb back up was definitely a challenge, resulting in shortness of breath and sweating…portions of the hike back up were so steep that you felt as though you were walking in place! We made it back to the top and the experience was well-worth it! We had dinner in the Bright Angel Lodge restaurant there in the Grand Canyon, then started back home (which is Flagstaff right now). As we headed out of the park, my dream came true: wildlife! There was an elk standing right at my window, then after I recovered from that excitement, traffic was stopped for 2 deer in the road. They were unphased by people or cars so I was able to get an upclose picture! The remainder of the drive was peaceful and of course filled with amazing scenery. We ended the night with pecan pie, coffee and dominoes at my aunt and uncle’s home. I was, of course, the winner of dominoes…yep, 1st place, the winner! Great ending to an unforgettable day. 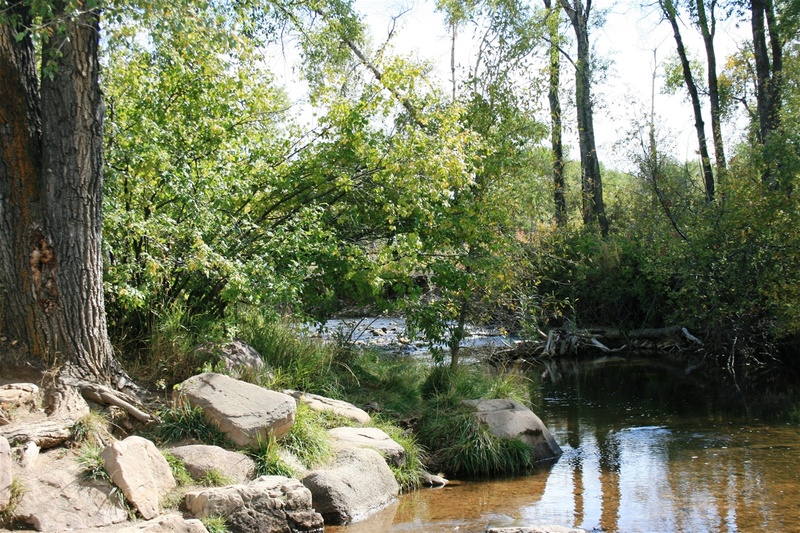 Tomorrow Sedona awaits! One of our view from the top of the trail. Every vacation has to have a down day and ours was today…Sunday, a day of rest. I loved church this morning with my family and hearing my cousin preach really made my heart happy – he is an amazing preacher, passionate about bringing people to Christ, and I am so proud to know this man. Lunch at Cracker Barrel was delicious! I had two orders or cabbage, not one but two! Stomach ache now reminds me why I don’t need to do that again in the future! 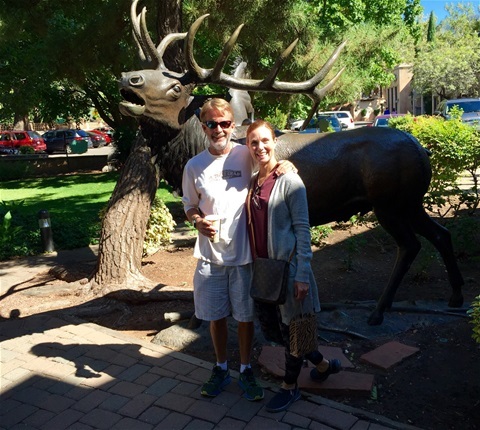 After lunch Mike, Marley and I went downtown and checked out shopping in Flagstaff! Lots of handmade jewelry and Native American Indian inspired artwork/crafts – very eclectic shopping selections and lots of coffee shops. I then napped followed by taking Marley to the dog park. That sums up our day. No running, no new trail and I took no pictures…I realize this makes for a very boring read. Headed to Grand Canyon tomorrow so I am truly excited for that adventure! Uncle Leonard and Aunt Mary - Uncle Leonard remodeled from top to bottom this entire house himself! It's 2 houses in one: they live on one side and Randy (their son) and Amy live on the other side! Pretty amazing! Today started early for Mike and Marley, but I had a little strugglitis this morning, so Mike sweetly let me sleep in! It is very cold here in the morning (in the 30’s) therefore getting out of bed is quite a struggle, hence “strugglitis”! We headed back to Buffalo Park for another run this morning. Marley ran with me today and we labored through a challenging 5 mile hilly run. Getting used to running at higher altitudes is difficult – your legs feel great, the weather is much cooler, but the breathing is an issue! Mike had no problem with his run! 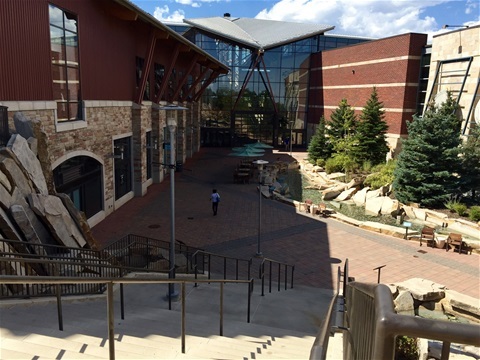 We then visited the local running store then I surveyed their mall (I had a nail emergency, actually) while Mike and Marley had some lunch and coffee! We spent the rest of the day visiting with my father’s side of the family – my Uncle Leonard, Aunt Mary, my cousin, Randy and his wife Amy and their daughter, Lindsey! There were also two amazing young women who joined us for dinner; they are teachers at one of the local Christian schools! I haven’t seen my aunt and uncle in about 15 years! We had so much fun talking, catching up and of course, eating a delicious home-cooked meal! My dad was also able to come over from Missouri to visit as well – nice surprise that I also was able to visit with my dad! Relaxing first day in Flagstaff with beautiful weather! 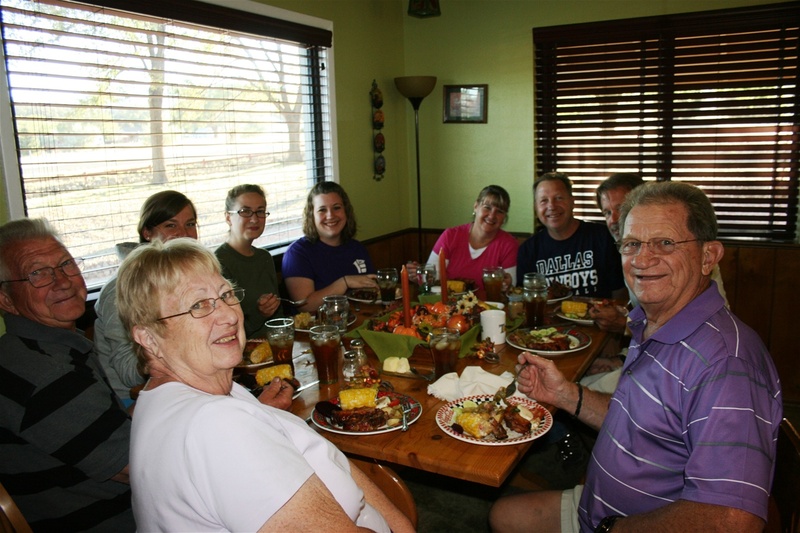 Tomorrow morning will be church followed by lunch at Cracker Barrel – it is cabbage Sunday! Family Dinner...so much fun and such good food! We have arrived! Flagstaff watchout here we come! We have arrived in Flagstaff, Arizona…in one piece and we still love each other! Nothing very exciting today, mainly just driving! Mike drove, nodded his head occasionally, while I talked about mindless subjects. We listened to music including my iPod playlist which is filled with snappy songs from the 80’s and 90’s and I surfed FaceBook. Yep, pretty boring! 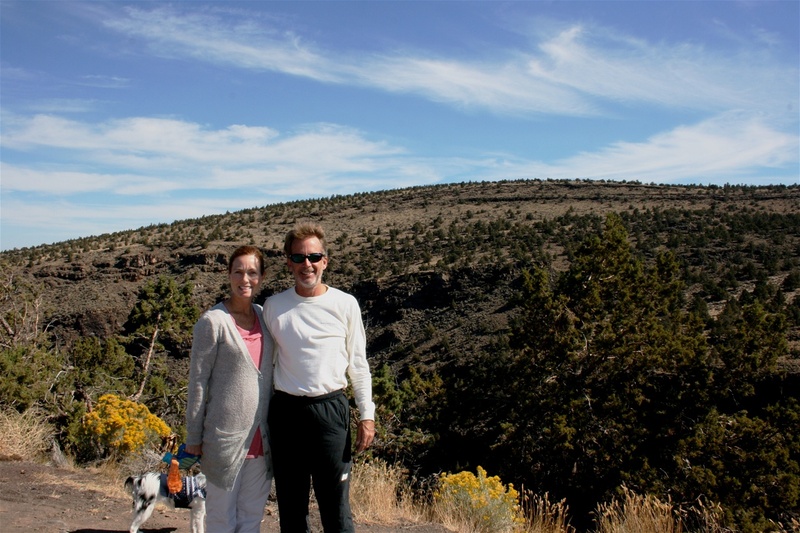 When we arrived in Flagstaff we stopped at the grocery and Petco, and then headed for a run before checking into the RV park. Mike found a local park with great running trails, Buffalo Park. The running trails were paved and winded through a beautiful park with views of the mountains in the background. As I was finishing up my run, I came around a corner where I almost ran over a photographer. I initially thought “wow, the blog has really taken off and the paparazzi have found me”, but I realized that wasn’t the case. I did wave, smile and give my best stride, though, as I was running by the photographer. Back at the RV I was explaining to Mike about the photographer and some photo shoot for a group of runners…this immediately caused his heart to race. He realized that the group of runners could possible belong to the Northern Arizona Elite running team, some of who qualified for the Olympic trials. Guess what we did next? You betcha – we headed back out to the trail and nonchalantly walked past the photographer to see if this was indeed the running team Mike hoped for! IT WAS…oh happy day! Mike was able to talk with the runners for a few minutes, take a photo with some of the team and the photographer actually took a couple shots with me in them because I was wearing a pair of HOKA’s (brand of running shoe) which sponsors this group of runners – thank goodness I bought those new shoes in Boulder! Meeting the running team was a great ending to the day! We grilled steaks and veggies back at the RV, enjoying a nice dinner at the campground, then settled in for the night. I hope Mike is able to sleep after the excitement at the running trail! Can’t wait to see what we get into tomorrow! After my run on beautiful trails through Buffalo Park with an elevation of 7100 feet...breathing was a little difficult! Today can be summed up in two words: spouse endangerment! So we left the beautiful rest stop this morning headed for Yosemite National Park, when Mike stated that he really just wanted to see the sequoia trees, so he decided we would change plans and head to Sequoia National Park. Lets stop here and note how he was so easily able to change the planned agenda for HIS sight-seeing, but let’s remember back to the countless points of interest that he would not stop for that I suggested (mall in Dallas, Frontier City, Wyoming Penitentiary). So now everyone is getting a better picture of how one-sided our adventures are up to this point! We arrived at Sequoia National Park, where we were warmly greeted by the gate attendant who kindly asked the length of our RV. Mike stated 26 foot to which she replied that we would only be able to drive our RV about 4 miles into the park. She explained that the roads were “dangerous” for anything over 22 feet and “strongly” recommended not driving further than the Potwisha camping area, which was about 4 miles into the park. Mike said thank you and she again reiterated that it is not recommended to drive further than 4 miles into the park because it is quite dangerous due to the narrow, steep and winding roads. Mike again says thank you. He proceeds to the visitor’s center to evaluate alternative transportation, such as the advertised shuttle, to the area of the park we were interested in visiting – Giant Forest Museum and General Sherman Tree. While Mike is in the visitor’s center I read the informational guide and come across an entire page discussing safety. Possible dangers while in the park include the following: drowning, disease precautions, ticks, giardia, poison oak, hypothermia, RATTLESNAKES, lightning, mountain lions AND THE LACK OF CELL SERVICE! Dear gracious…who wants to go in the park now? I’m done; we can’t drive the RV safely anyway, so I was good with just driving today and checking out the scenery on the road – I decided I would tell Mike my decision when he returned from the visitor’s center! Mike returns to the RV after chatting with the visitor’s center and states “We are going to go ahead and drive in.” Wait, what? Did he not just hear the gate attendant say several times in many different ways that taking our 26 foot RV more than 4 miles into the park would be dangerous? Mike continues by saying that the area we want to see is about 13 miles into the park and he was advised that the road was narrow with many hairpin turns but if he decided to proceed then just drive slowly, stay in his lane and be mindful of the cars around him. Really? “Just drive slowly” was the answer here? The next 13 miles up a steep, narrow incline to 7000 feet elevation with a bazillion hair pin turns was excruciating. As I’m gripping the arm rests, sweat pouring off of me, Mike decides this really isn’t that bad and wants to pretend we are in a scene from the Dukes of Hazard! I loudly and sternly remind him there are no guardrails, this is not the death speedway, to keep both hands on the wheel at 10 and 2 and SLOW DOWN! The man who is deathly afraid of heights, responds calmly with “We have all of our documents worked out, my sister knows where everything is and we are both ready to meet Jesus, it will be fine.” Now I’ve had it! This little adventure is over…at about the time I was going to have a complete come-apart, we reach our destination! WOW, JUST WOW…it was overwhelming. The trees were something out of a science fiction movie or created by Disney. They were so gigantic and breath-taking they looked fake! We spent about an hour walking the trail, taking it all in. 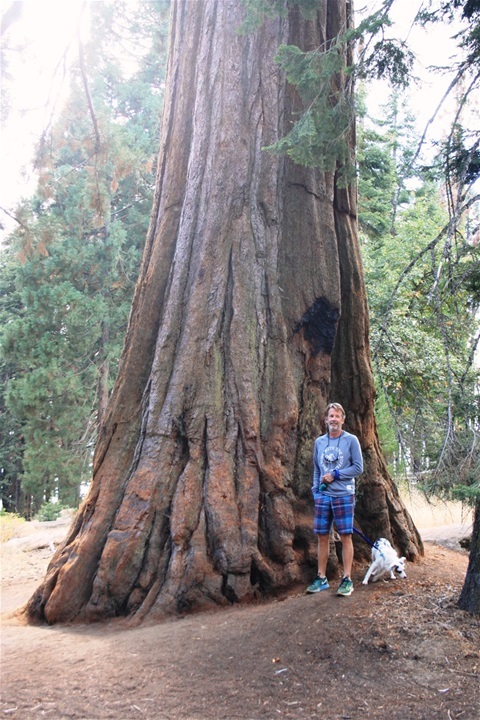 The General Sherman Tree is the largest tree in the world according to the literature…it was unbelievable! It was very difficult to get these large trees in a picture – but I tried! As we are walking back up the trail, a truly amazing moment occurs! We see a mama bear and two cubs! It was so COOL! But then the uncool part…the battery is dead in my camera! NOOOOOOO! We watched the bears for a few minutes and then headed back to the RV to get back on the road. I strapped myself in and prepared for the traumatic drive back out of the park. Apparently we did not die in the national park today. Mike had pretty impressive driving skills, actually. We are now “resting” at another fine rest area en route to Flagstaff…our final destination spot. These days on the road are rough, but I know will be worth it once we arrive tomorrow. Only 5 hours of driving tomorrow…wooohooo! The next few days are sure to hold some incredible sights…my camera battery is currently charging! General Sherman Tree - largest tree in the world. Most beautiful day so far on this cross-country adventure! 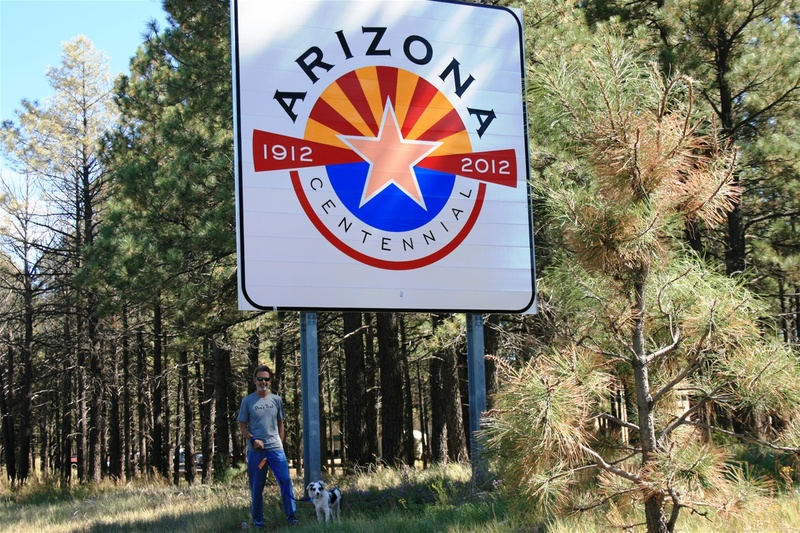 I’m so proud of Mike for altering the agenda and adding one more driving day to get to Flagstaff. 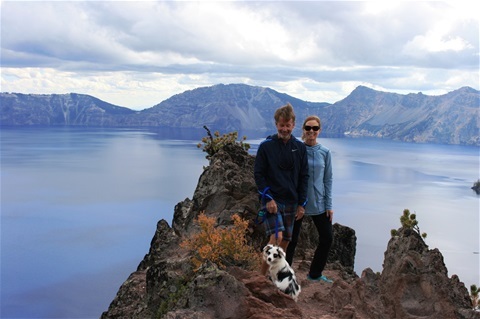 It was hard for him but he took a detour today so we could spend some time at Crater Lake National Park – not a penitentiary tour but I will take what I can get! Crater Lake National Park protects the deepest lake in the United States. The lake is fed solely by rain and snow, no rivers or streams, so it’s considered the cleanest large body of water in the world. It has an amazing intense blue color that hopefully you can see in some of the pictures. The lake rests inside a caldera formed over several thousand years ago when a 12,000-foot-tall volcano collapsed following a major eruption. The lake was simply breathtaking surrounded by rock formations, wildflowers, greenery, waterfalls and forests of trees. I could have taken 100’s of pictures. Someone could easily spend 2-3 days in this park exploring, hiking, and camping (preferably in an RV, but Mike feels that tent camping would have been fantastic). There are also lots of bears in this area, hence every campsite has “food lockers” available to lock-down your food from the bears at your campsite…do you see now why I think tent camping may be a little questionable! Mike is deathly afraid of heights so some of our sight-seeing today caused a bit of anxiety as well as driving the RV up some of the mountainside roads without guardrails. I tried to reassure him stating that there were grasses meadows leading down the mountain, so if we were to fall off the side likely we would simply roll to the bottom, it would be okay! Marley had a ball today, running down the trails, sniffing out exciting critters (chipmunks) and feeling frisky in the 40 degree weather. As we climbed the mountain, I continued with wardrobe changes, because it kept getting colder as we climbed so I kept adding articles of clothing! 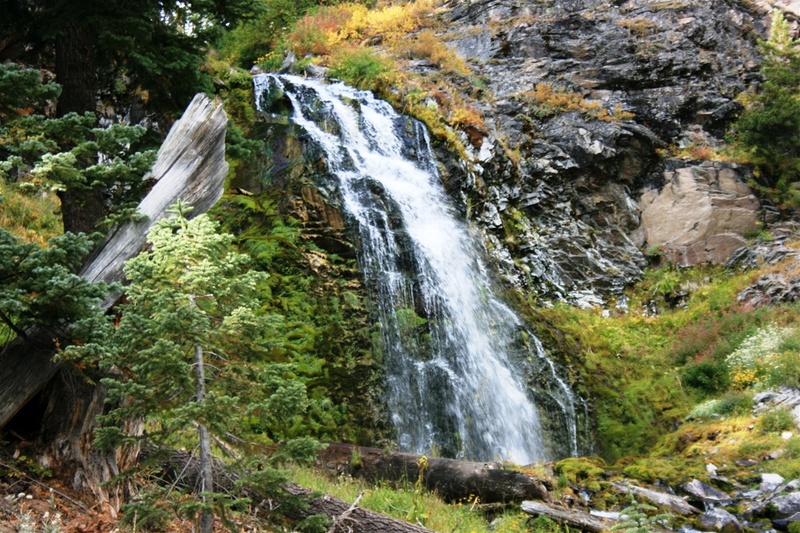 We hiked to a beautiful waterfall that was strictly fed by rain and snow run-off…it was spectacular! When you see what we saw today, there is no doubt in God as creator! 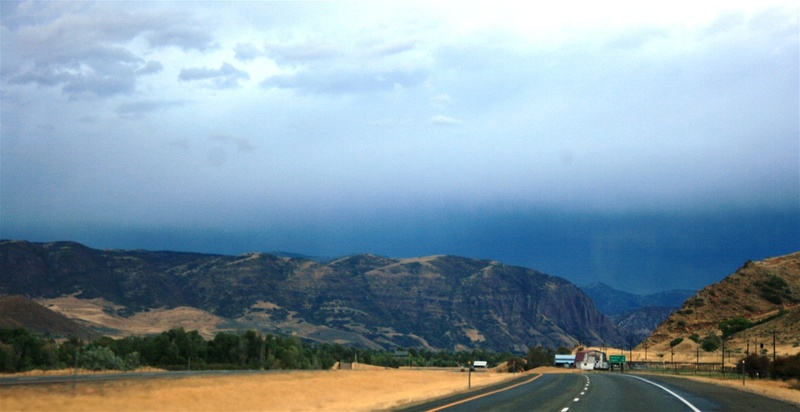 We will drive a few more hours into Sacramento tonight as we journey along to Flagstaff, our final long layover. Tomorrow should be just as incredible because we are visiting Yosemite, again not a penitentiary tour, but you take what the driver allows! Today was INCREDIBLE! We spent the day in Portland, touring the Nike headquarters (they like to refer to it as Nike “campus”). I truly cannot describe this place to you in words…honestly it is amazing! We started the tour in the Prefontaine room and were given the history of Nike. This in itself is a pretty cool story and helps you appreciate that Nike is a different sort of company from the beginning. There is a book about the history of Nike that Mike has read and highly recommends it to anyone who is a history buff – “Bowerman and the Men of Oregon”. Okay, now back to the day. After the short history segment we were able to see most of the campus and also run into LeBron James, who was there today to spend time with the designers and engineers regarding his line of Nike apparel and shoes. We were also able to catch a second sighting of him playing kickball with some of the employees. Yes, they take a break from work and play kickball…I know, it sounds like a dream job! The campus is composed of administration, shoe engineers, designers, research, marketing and PR`, along with unbelievable perks for the employees. The one thing that really stood out about today was the fact that Nike practices what it sells! They sell athletic wear and their commercials focus on hard work and wellness, so they promote that for all employees. There are 2 cafeterias, all serving healthy, organic choices. All items in the cafeteria are labeled with their nutrition information and usually come from local food growers. There is a wellness clinic on campus that includes medical care, physical therapy, massage, acupuncture and mammograms – all at your work; can you imagine? There are 2 separate exercise facilities, an indoor pool, spin class, weight lifting area and an outdoor track or trail for running or walking. The exercise facilities are equipped with full men’s and women’s locker rooms with showers, towels and all amenities. ALL employees are encouraged to exercise daily and eat healthy, so much so they offer flex time so you can exercise at work! AMAZING! I did not see one person in a suit today, it’s all Nike apparel and very casual. Then after the tour we ate in the cafeteria which was DELICIOUS, then ventured over to the Nike company store where we went crazy!! Not really that crazy, but it was a lot of fun to shop at the actual headquarters. This store is for employees only or if you have a pass issued by the company – very cool! Then it happened…the heavens opened and there was singing! I WAS ABLE TO DO MY WORKOUT ON THE NIKE TRACK! Mike said there was no track workout today and when they contacted us about the tour we were told that we would only be able to see the track and unfortunately not run on it. Well, I really wasn’t happy with that. I told Mike, “We are getting on that track!” He chuckled! Well, we got on that track for as long as we wanted and were given use of the exercise equipment, locker rooms, sauna, spa… the works! After my track work-out we walked the Hollister trail (named after Nike’s 3rd employee). It was the BEST day yet. I left knowing I would be supporting Nike much more in the future because today I realized they stand behind their product, practice what they sell, treat their employees well and also support other areas such as cancer research (there is a cancer center on campus too). We ended the day with pizza outside on the porch at Coburg’s Pizza Company…yummy! We hit the road tomorrow, traveling for the next 3 days to our next stop of Flagstaff, AZ!! I end tonight saying, “buy more Nike”!!! Running on the Nike track! Coming to you live from Eugene, OR! Pre's Rock - site of the fatal car accident that has now become a memorial. Coburg Pizza Company...lunch AND dinner today! Another adventurous day here in Coburg, OR! We woke to a cold, rainy morning so that called for several cups of coffee, reading and some laundry. Yes, I am forced to use a public laundry facility as part of this cross country experience…I thoroughly inspected the laundry room and it was pristinely clean, no funky items in the lint filters and it smelled great! Once the rain cleared we spent the day on the bikes checking out the town of Coburg and some of the nature trails. The trails were beautiful and the leaves have started to change colors! I was a little hesitant on the trails because of possible snake encounters, but Mike and Marley went first to fight off any unforeseen reptiles! We biked another trail around the big lake that was lined with so many trees and different types of flowers. One of the parks had a huge dog park, so Marley had a great time meeting some new furry friends and playing Frisbee. 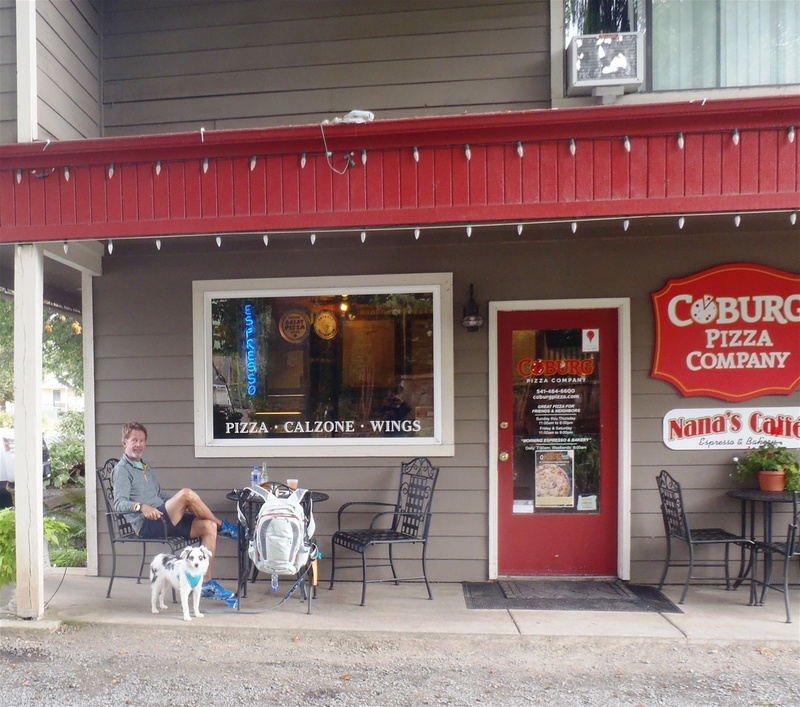 We ate lunch at a local pizza place, Coburg Pizza Company, which was absolutely delicious. At lunch we met a guy, Ron, biking from Portland to Eugene. What a great guy who knows how to live life! He’s biked all over the United States! He lives in San Diego, so he took the Amtrak train from San Diego to Portland and from there was biking to Eugene. In Eugene, he takes the train back to San Diego! What a fun lunchtime conversation we had with Ron! On our way back to the RV we stopped at Camping World…the mecca of RV shopping! As we drove up to the store I think I heard singing, like angels singing, can’t be sure. I always get the catalog but today I got to experience the entire store in person! I never thought I would get excited about waste hose paraphernalia, step rugs, or other camping supplies, but it was AWESOME!! 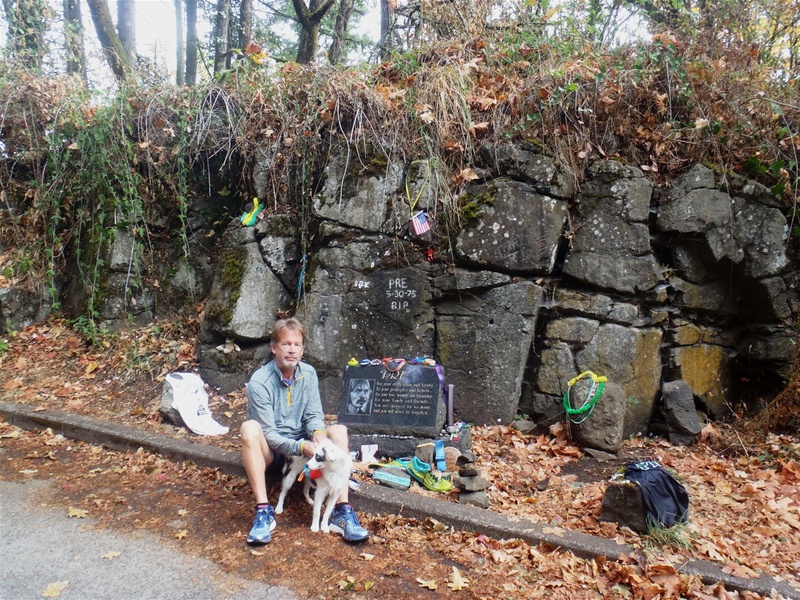 Tomorrow will be another truly memorable day as we venture to view the Prefontaine memorial rock and run the Prefontaine trail. 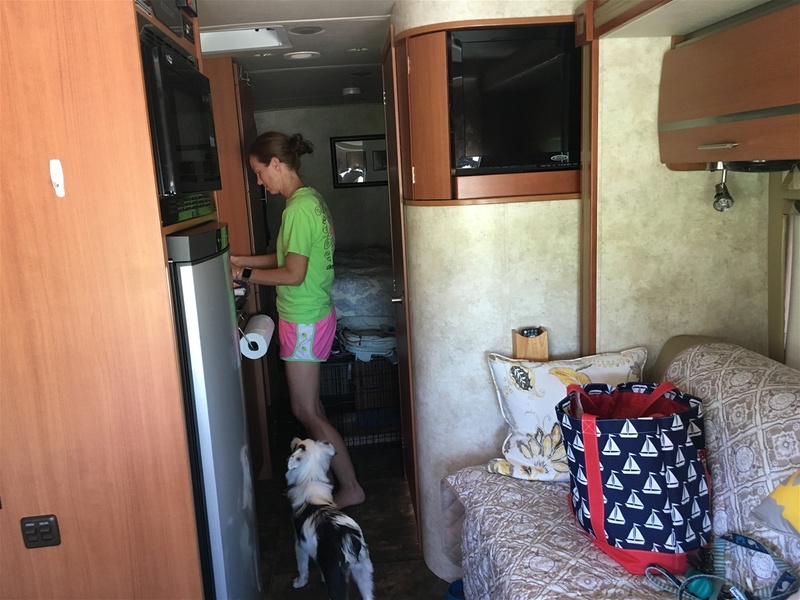 This trip has really been a blessing for us, can’t believe we are at the halfway point…we may need to consider becoming professional RV’ers (just kidding, the closet and the shower are just a little too small for this to last longer than 30 days)! 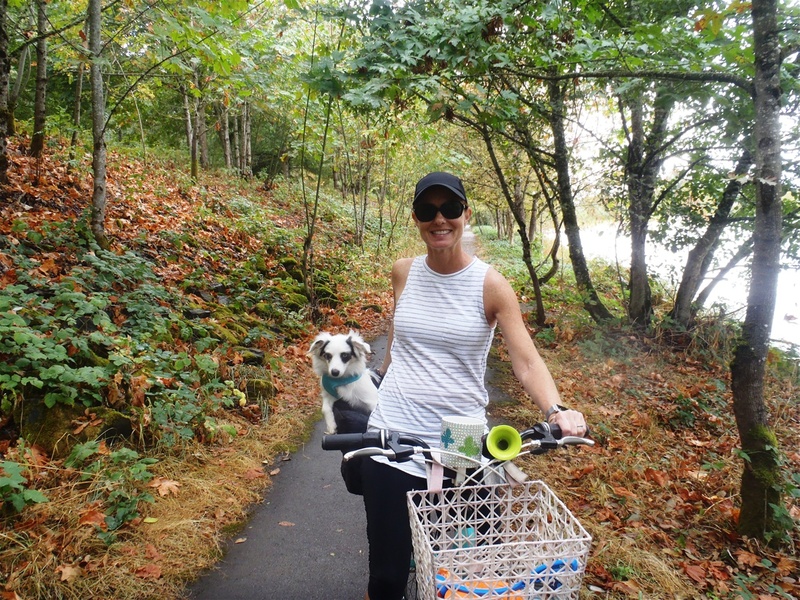 Marley and I enjoying the ride on the trail in Coburg. First in his age group! What a great accomplishment at a once in lifetime race! I, Mike, am the guest blogger tonight, since Sonya felt I should document this pinnacle part of the trip! Well, we made it to our next destination, Coburg, Oregon which is just north of Eugene by about 5 miles. A nice campground just outside of small, quaint town with a great ambience. We ate at a local restaurant with a wrap-around porch before checking in. We capped off the meal with some hand scooped ice cream and let Marley play at the park next to the ice cream store. He loves his new frisbee and playing ball. We had to medicate him this morning to make sure he didn't freak out when we left him to go run the race. He appears to be no worse for wear and is back to his normal self. So, yes today was quite a day. When I began looking at this voyage or adventure we were going on I wanted to pick out a few places that were strong running communities in addition to great sites along the way. One obviously is Eugene where the University of Oregon is located. I also knew that Steve Prefontaine grew up not far from there and so when looking into his hometown I came upon the memorial race that they have in his honor. It fit right into our schedule! About a year ago I decided to register us and make Coos Bay and that race a part of our trip. To say that the morning was emotional would be an understatement. Being able to run on the roads that he did and with some of the same people he did was surreal. The race time really didn't matter to me. I knew the course was going to be challenging and not one where a personal best time would be accomplished. More important to me would be to provide the effort that matched my fitness and also would give credibility to what this race and who it is for was all about. I feel like I accomplished that. I was fortunate enough to finish first in my age group! Afterwards while getting ready for the awards ceremony I had the privilege of meeting Steve Prefontaine's sister and having a really sweet conversation with her about how much I looked up to him as a young runner back in the early to mid-1970s. The people of Coos Bay did an incredible job of honoring who this man was. It was first class all the way. 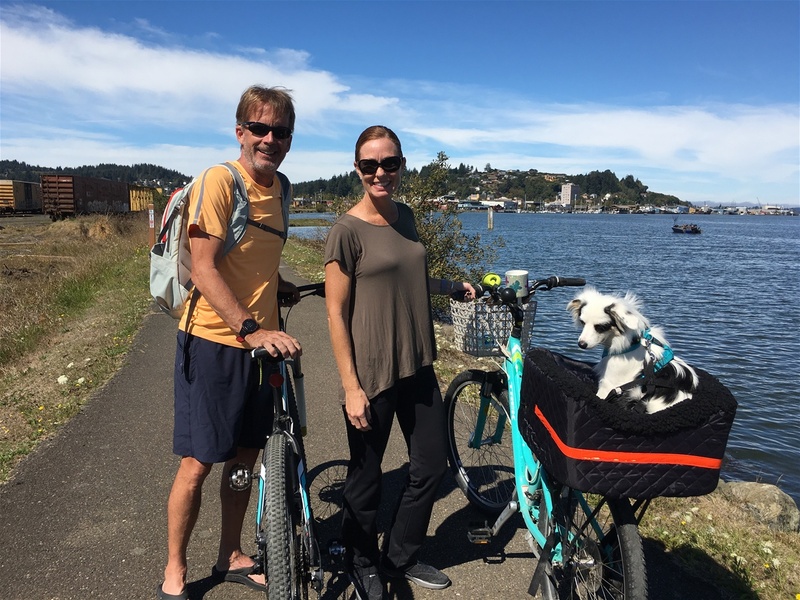 We left Coos Bay with lifetime memories and are now onto the next leg of the journey. Thanks so much for tagging along. So let me, Sonya (editor in chief) add that I completely agree with everything that Mike said, but my perspective of the actual race was a bit different. The hills were heinous and never ending! I kept wondering where the downhills were…we always seemed to be on the uphill! At one point I was very vocal saying “Is this hill ever going to end? How many more of these do we have to endure?” This was at about 2.5 miles, where I met some great ladies that were chuckling at my struggle. They knew I was not from anywhere around the area, so I explained I was from south Florida where our only hills were speed bumps! They were great and motivated me through the next mile or so and of course they then took off, because they could with no problem run the hills. When I thought the bad hills were over, I began to see signs wishing the runners luck as they approached “agony hill” AND “summit hill”…mother of pearl! I knew this was terrible, so I turned my music up and told agony hill I was coming for it! I didn’t really impress agony hill, but I didn’t walk and finished under an hour, so I was pretty happy! My legs and buttocks are going to be on fire tomorrow! The ladies I met on the road found me after and congratulated me on finishing…yep I must have looked that bad, that there was a question whether I would finish or not! Can’t wait to mill around downtown Coburg tomorrow and see what treasures we uncover! 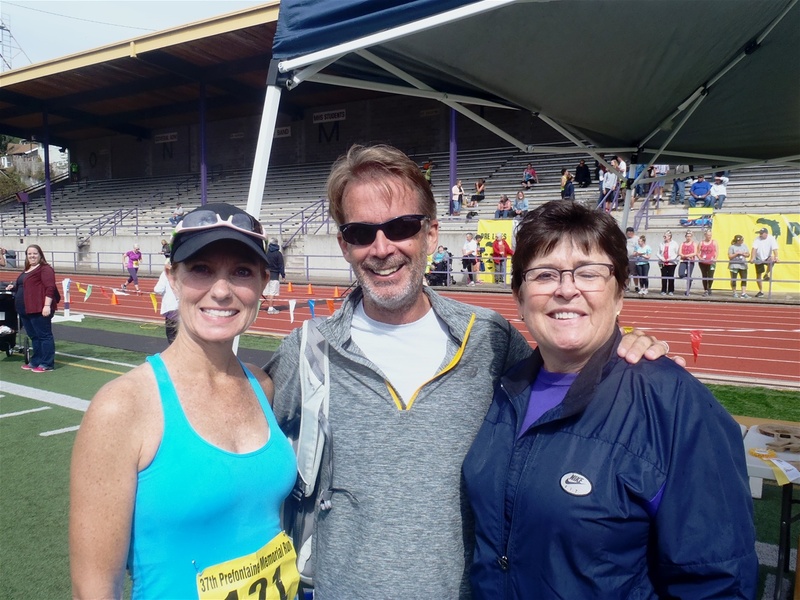 Mike had the incredible honor of meeting and talking with Steve Prefontaine's sister. Headed out to explore Coos Bay! Today was a successful adventure in Coos Bay! It’s a simple, quaint, fishing town without a lot of bells and whistles, but I realized today that is what is appealing! The people we have met so far are genuine, real people who love their town. 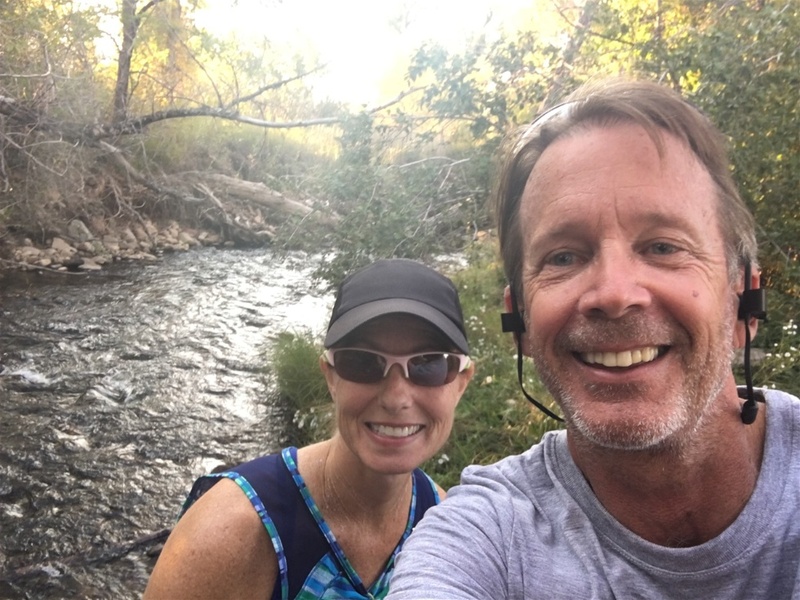 We started the morning with a run, Mike ran 3 miles and I ran 5 miles (not bragging – Mike is tapering and I’m just running, with no plans to “race” tomorrow). Mike and I ran the first 1.5 miles together around the bay and down the boardwalk – the view over the bay was beautiful, quiet and serene. There were people all along the boardwalk, fishing, and waiting for that one big bite! The temperature this morning was in the 50’s, so the run actually felt great! Ran by a marijuana dispensary, not realizing it is legal in Oregon. Funny sign on door that you can’t smoke in or around the store…hmmmm, they will sell it and promote it, but please take it elsewhere to enjoy it! After the run, we did a grocery run, and to be such a small town, the grocery store was impressive! Very nice deli, so much so I had a hard time deciding! After unloading groceries, we got on our bikes and headed into town to explore! They are not a treatless town, thank goodness. They have a Dairy Queen! We got lunch and blizzards to go and rode over to a local Park, Mingus Park where we enjoyed our treat and Marley enjoyed taunting the birds! The park has a nice lake, playground and up the hill some nice biking and walking trails. The next stop was almost too much for Mike and I thought he would need to sit and compose himself, but he made it through. 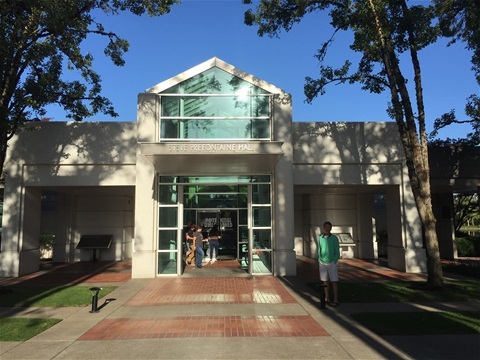 The Coos Art Museum holds an entire room dedicated to the memory of Steve Prefontaine with at least a dozen framed pictures and an entire case filled with memorabilia! Mike was like a kid in the Disney World candy store on Main Street (if you’ve never been to that candy store, it’s like being live in the Willy Wonka story). It was pretty amazing and at the same time bitter sweet that such an amazing athlete was lost so young and at the pinnacle of his career. The last stop of the day was packet pick-up for the big race tomorrow!! The course was briefly described to me for the first time today and when someone describes a hill called “agony hill” and another steep hill at the end, the race suddenly becomes a bad idea; actually a really painful, bad idea. My mind flashed back to the possible need for that medicinal marijuana store from earlier…for a few minutes (actually for the past few hours) I have contemplated being a spectator. Mike should have someone taking pictures so this pinnacle of a race can be accurately documented. I’m really the only person who can fill that position. Who will take pictures or blog if I die tomorrow?? But then I decided, we drove over 3000 miles and I have a great outfit complete with cute socks and monogrammed racing top that really shouldn’t go to waste, so “agony hill” I will see you tomorrow! Mike plans on writing tomorrow, which I have encouraged so he can give you the blow-by-blow of the race, just as if you were there! I know, so excited you can hardly wait for tomorrow’s entry! Having a runner relive their race in explicit detail is always so captivating! Now we are settling in to watch “Fire On The Track”, a documentary about Steve PreFontaine… got to get my popcorn ready! In front of Coos Art Museum...the plaque contains a quote form Steve PreFontaine. Mike visiting with long-time friend, Peggy. Tonight’s entry is pretty late! It’s been a busy day – not really sure doing what, but here I am at 10:00 p.m. writing my diary entry. Our day started off with Mike and Marley going for a 3 mile run in the 28 degree weather. The cold seemed to make him extra frisky and fast (talking about Marley)! There were a ton of deer out this morning, including does, fawns and a couple of bucks spurring! 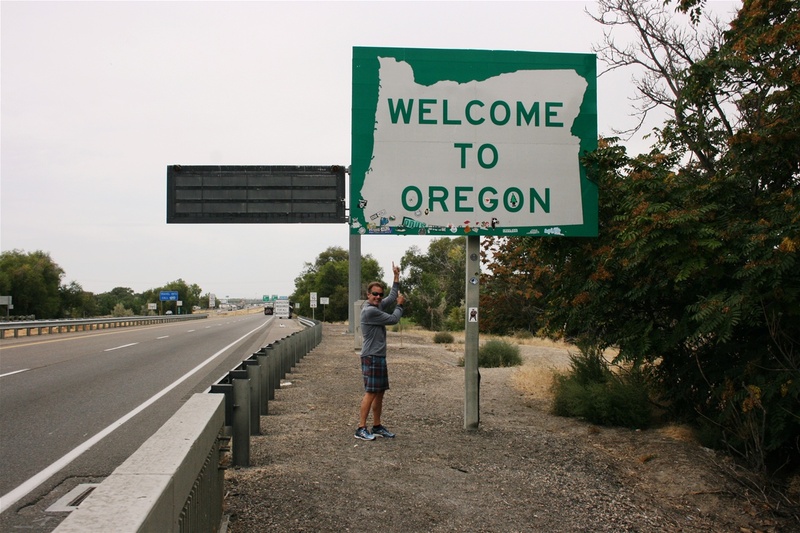 We then loaded up and headed down the road to the pinnacle of the trip…the sole reason for the trip: COOS BAY, home of Steve PreFontaine! We made a stop in Bend, Oregon which is beautiful and very clean…my kind of town. This stop in our journey was for lunch with Peggy (and her 2 grandsons), an old friend and former colleague of Mike’s from his days teaching at Spring Valley High School. Mike truly enjoyed reconnecting and catching up with a dear friend. The scenery was again remarkable and at one point we made a climb through the mountains to 4800 feet elevation! There were many more trees, greenery and mountains on today’s drive than we have seen thus far! Again, not many stops for photo ops thanks to my very focused driver (“we must get there!”). Along the way we did make a pit stop in Eugene to see the vet for Marley’s new found anxiety problem. The vet was amazing and the staff was AWESOME, complete with peanut butter treats! We left with doggie valium so the visit was a win! Finally, I was able to persuade Mike to stop at the elk viewing spot – it was spectacular! They were off in the distance but there were probably about 20 elks out in the field. I posted a picture but unfortunately because it’s pretty far in the distance, you can’t really see how cool it was! We finally arrived in Coos Bay, remember, the pinnacle of the trip, the highlight of the 3300 miles in an RV. So here we are in a small town on the bay (hence, Coos Bay) that appears to be mainly a quaint fishing town…that’s it. Not even a Wal-Mart or Dollar General that I can see! I do think the run along the boardwalk around the bay will be beautiful in the morning, so I look forward to that. We plan to visit the PreFontaine Memorial Site (Pre’s Rock) and PreFontaine Gallery…which could likely be the only two things in the town! Our waitress tonight did suggest some local sights, so we will see where that leads. It will be a very interesting next few days, so stay tuned! Geological site located between Burns and Bend, OR. Huge canyon behind us! Just to break the monotony, today's adventure is brought to you live! It's cool here with a low tonight in the 30's!! Made beef fajitas in the crock pot and getting excited about reaching our next big stop...Eugene, OR!! We have made it to Utah! And here we are on the “road again, goin’ places that I’ve never been, seein’ things that I may never see again”. Just picture me sitting next to you singing this Willie Nelson song! Before we left this morning Mike visited a local high school track by way of a trail along the big lake. 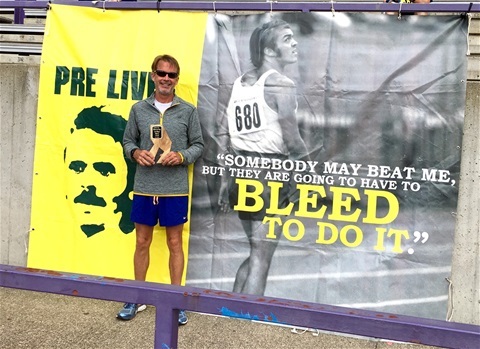 Despite 40 degree temperatures and a drizzling rain, he was out there determined to prepare himself for the ultimate race, the pinnacle of this trip – the PreFontaine Memorial 10 K on Saturday. 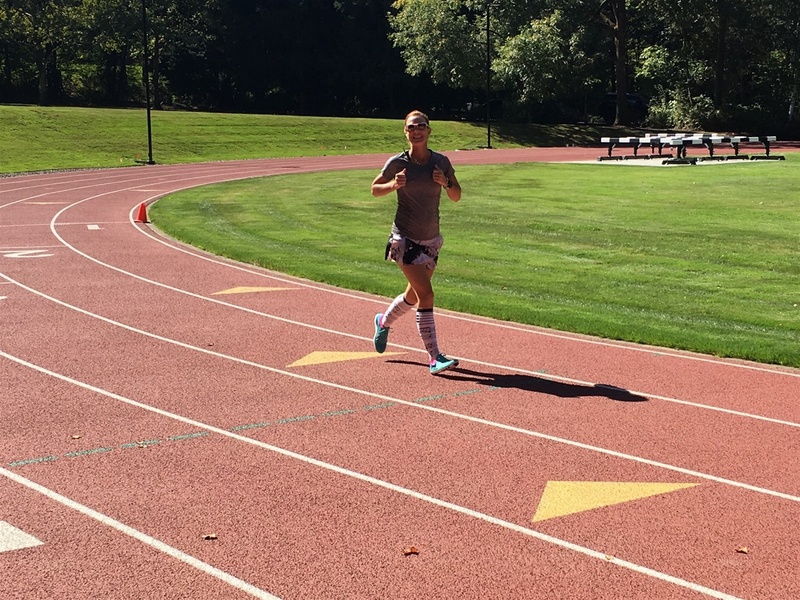 Yep, we drove over 3000 miles to run 6 miles…its completely normal! We also worked through an unexpected small situation at home to start the day. Kristyn spent a few hours in the ER, diagnosed with appendicitis! Not good when your Mom is thousands of miles away! Luckily I have an amazing friend who stepped in and "played" Mom. After an evaluation by a surgeon, it was felt we could try antibiotics and maybe avoid surgery! Whew! Her appendix just had to act up after 21 years while we are on a once-in-a-lifetime trip! We will be on the road the next 3 days, but I have faith that I will love this part of the drive because now the scenery is really becoming something to see. I’m still struggling with my driver, however, given that he is focused on getting from point A to point B, passing all sorts of photo ops and interesting sights, such as the state penitentiary in Wyoming and historical landmarks! He claims my choices are not all that great…so stayed tuned to what he labels as great (so far he has suggested a beautiful waterfall…we haven’t even passed a waterfall or know of one coming up!). We have started to see some gorgeous mountains and majestic rock structures. The trees are scattered all over the mountains and are the darkest of green. 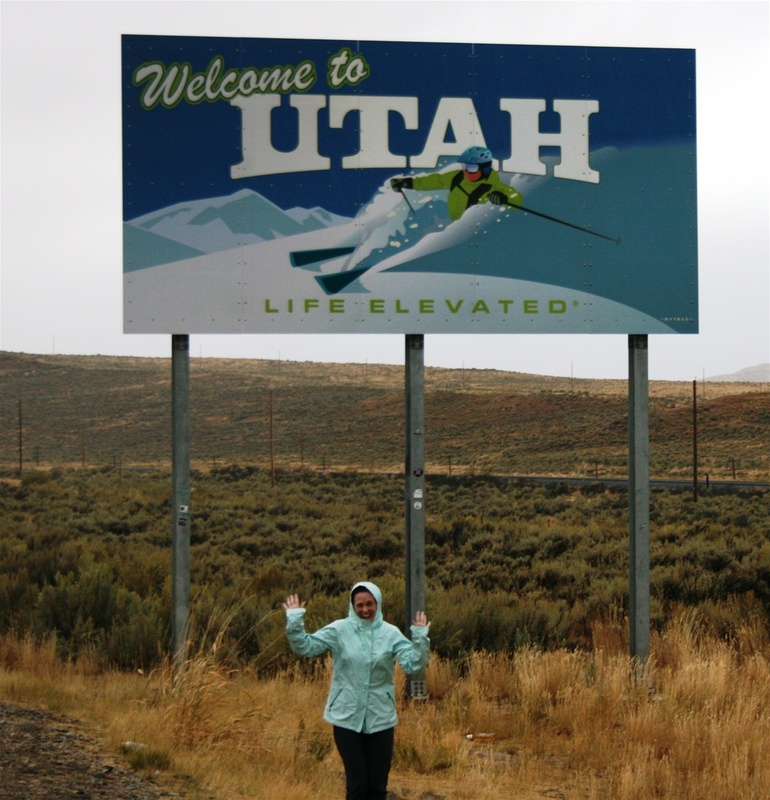 We left Wyoming later this afternoon and entered Utah which is spectacular so far! The drive has taken us through pretty desolate areas so, again, we find ourselves in treatless. But then…we came upon “Little America” which offers “upscale” hotel accommodations, a playground, diesel gas, a “hot grill”, souvenirs AND a $0.75 ice cream cone! Say no more! This is where we took a little stretch, a break from driving and enjoyed our treat! Marley also manipulated Mike into helping him enjoy the ice cream. So far, we have been blessed with no road causalities until today and it happened! The storage container for our dump hose broke on one side and was dragging behind us on the road as our red waste hose flung out into the road! We were oblivious to the loss of our hose or to the large white storage unit dragging loudly behind the rig…until a nice driver flashed his lights and informed us of what was happening. Then, he pulled over when we pulled over! I screamed “Don’t get out of the RV, Mike! It could be a set-up…who tells you about the loss of your waste hose then pulls over to help?? It’s not like we have a flat tire. It’s a serial killer – he’s going to take your life, kidnap me and make Marley into soup. Just don’t get out!” Mike did not heed my warning! We are still alive and now minus a waste hose and storage container for said waste hose. According to Mike, we are staying at a rest area (yes, once again) with beautiful views and I’m “gonna love it!” Sometimes I wonder if he really pays attention to who he is married to. We have arrived at our scenic rest area and likely I am unable to adequately appreciate the beauty of this particular rest stop because its dark, so I am just going to enjoy the homemade chicken noodle soup that has been simmering in the crock pot. I’m sure the majestic beauty of this rest stop will be all too clear in the morning in the light of day! Just look at those amazing mountains...who can doubt God as creator when you see this? Today was another day in Boulder! I ran early this morning on the Loveland recreational trail which is a paved trail that stretches through the entire town of Loveland – Stuart really needs to get one of these! I ran out and back around the big lake – great scenery, great weather and I walked a bit with one of the communities older ladies who was really great to talk with! 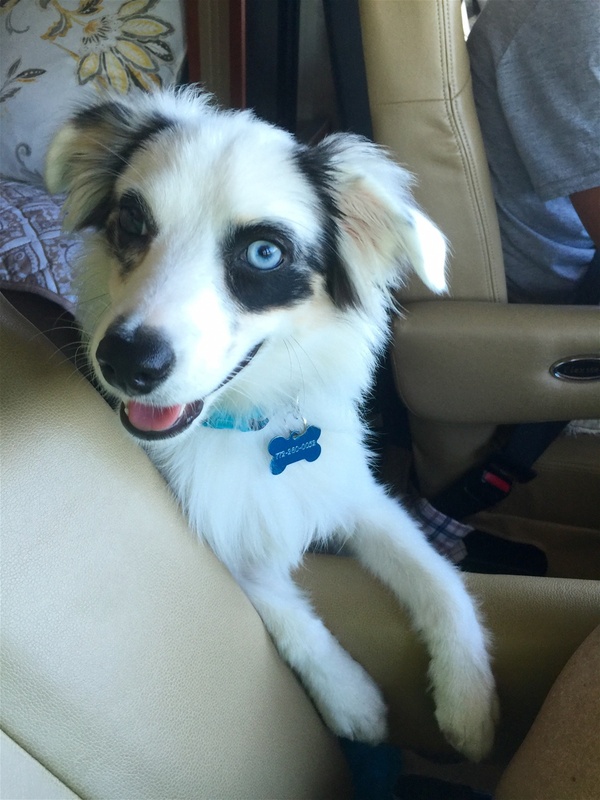 Next stop was picking up our boy from doggie camp! The staff said he was a great little camper and he was overjoyed to know that we had not deserted him and we were back! We then headed to the trails for a 3 mile walk along a beautiful creek! This was the best part of the day (for me!). The trail was so pretty and the weather was crisp and cool. Marley loved it and for the first time, jumped into the creek which was ice cold. Our final stop of the day was a group fun run with the local Fleet Feet store. Mike enjoyed this run while Marley and I went sightseeing in downtown Boulder, which by the way is not very pet friendly. 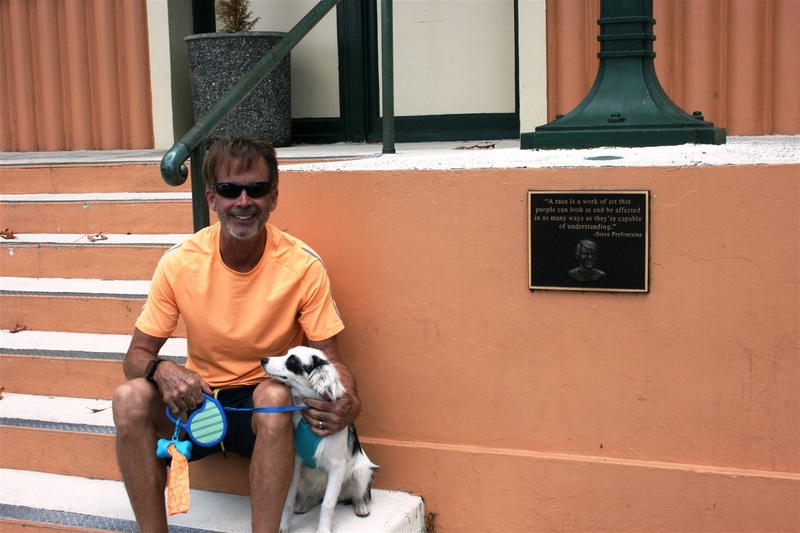 We rock in Stuart for our love of dogs in the downtown area and at local eateries that allow dogs on the patio! We did locate a local barbeque joint that was delicious and dog friendly! Here we are now getting ready to call it a day and plan to start the drive to Eugene, OR tomorrow. This will take about 3 days, with about 6-7 hours on the road per day and few nights at rest stops, so as I close tonight I say – pray for me! The best part of today - a hike along a beautiful creek! Please note, you get the guy perspective today. I've always had an adventurous side but it always has been tempered with a fear of taking risks. About two years ago I started to look at how time has flown by and we just never know what the future will bring. So for one of the first times I decided to take a risk and purchased an RV. That is when this trip began to take shape. 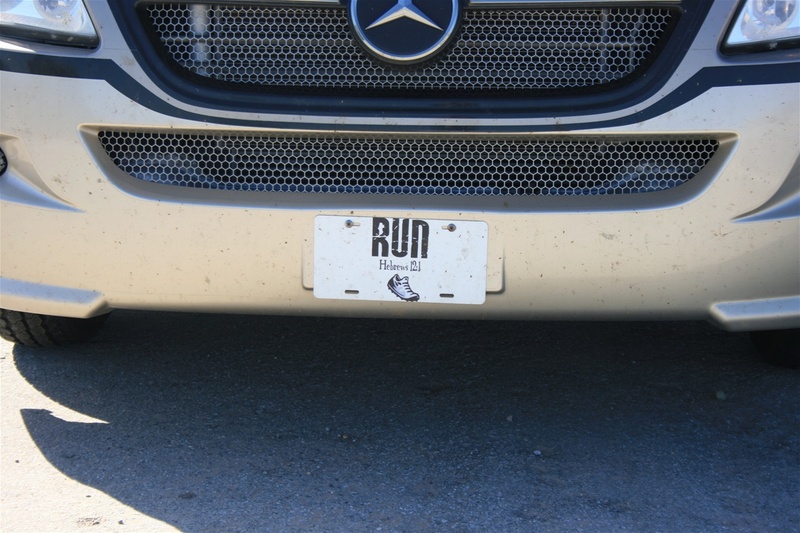 I have never traveled across the country and couple that desire with my love of running. A love that started close to 45 years ago when I ran a mile around my block to see how fast I could go after watching Frank Shorter and Steve Prefontaine at the 1972 Olympics. 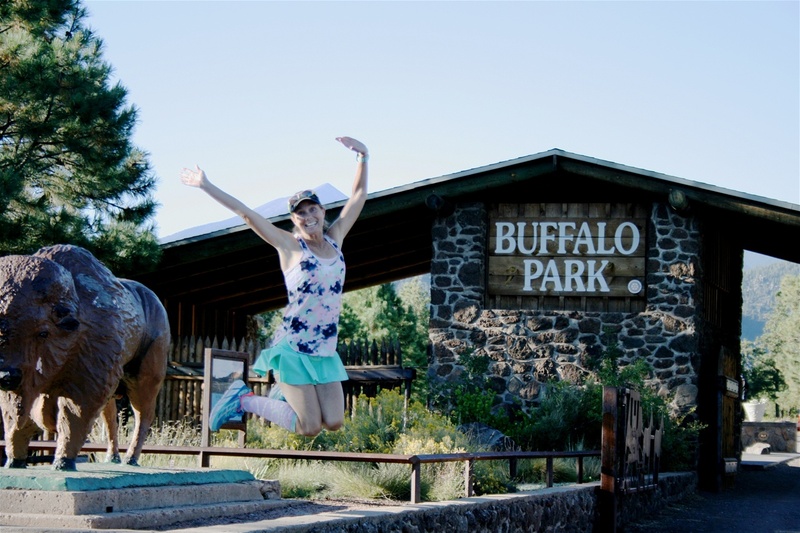 So, as I looked at our trip and the amount of time we would have, I chose a loop that would allow us to visit three of the current places to visit if you are a runner: Boulder, Colorado, Eugene, Oregon and Flagstaff, Arizona. So, here we are after four days and 2000 miles of driving at our first destination- Boulder, CO. We woke up to 51° temperatures and no humidity. Marley and I started the day with a nice walk over to the dog park adjacent to the RV campgrounds. It was, then, time to check out the Boulder sites. 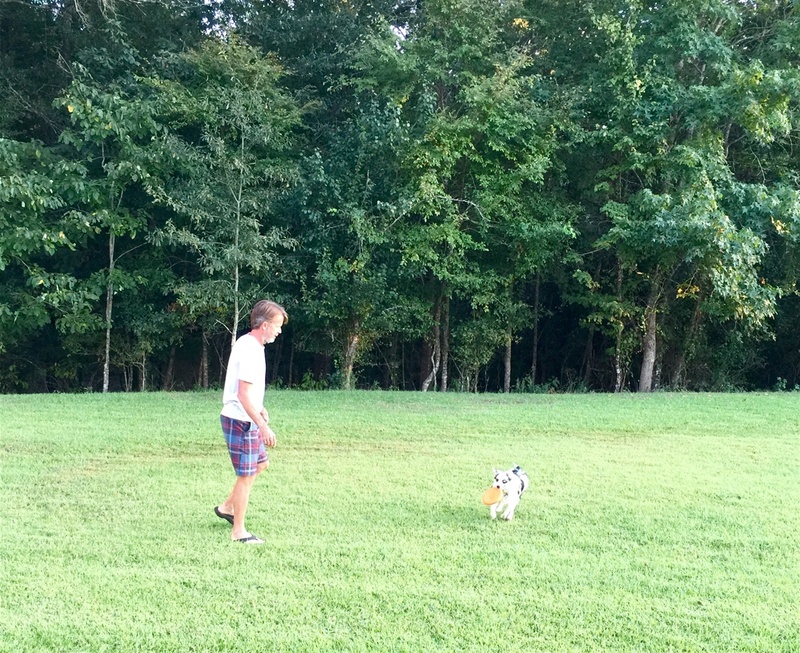 We dropped Marley off at doggie camp for two days to give us a little freedom to roam. Why did it feel like we were dropping our child off at daycare? In Boulder we found the town to be quite eclectic - lots of shops, food places and quite a diverse group of people. Let's see, a gay pride parade, a street corner evangelist, the occasional homeless person and various street performers. Quite the ten block walk! 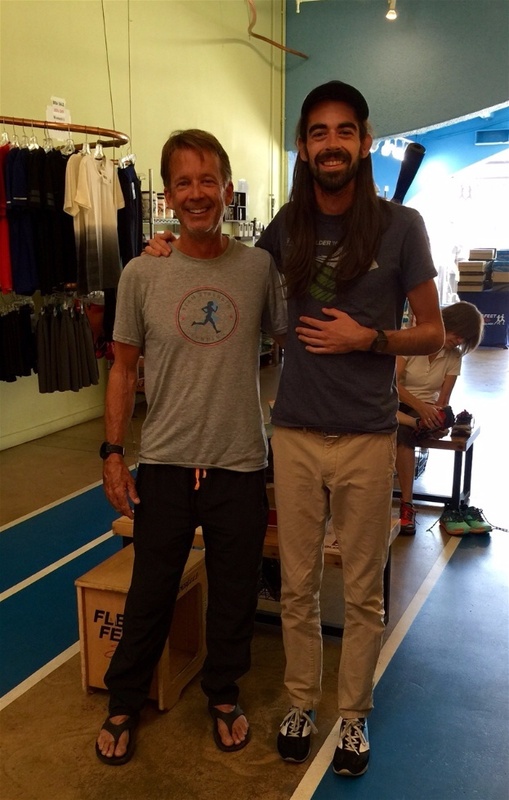 We made it to both local running stores with the highlight of the day coming from the second store as we met Noah Droddy, who was this year’s Olympic 10K trial qualifier and also received much social media acclaim (look him up!). Super nice guy! It was off to a run on one of the many trails that Boulder is known for. We ran ten miles on the Bobolink. Hoping for cooler temperatures to help deal with the 5,400 feet of elevation…91 degrees was not what I was looking for. Oh well, the low humidity helped as did the beautiful sites. We capped the day with a crazy sunset over the Rocky Mountains followed by carb reload at PF Changs. Well, that's it for me for a bit. Your girl will be back tomorrow. Oh and just let me add (this is the girl who is proofreading his entry for today), the run at elevation with some minor hills resulted in extreme nausea, SOB, chills and the momentary question of whether EMS was needed…the runs for the remainder of this trip BETTER improve! A selfie at the end of the run is always fun, especially with great scenery! Our little spot for the next 3 days. Today finally got exciting with a change in scenery! We have made it to Colorado! 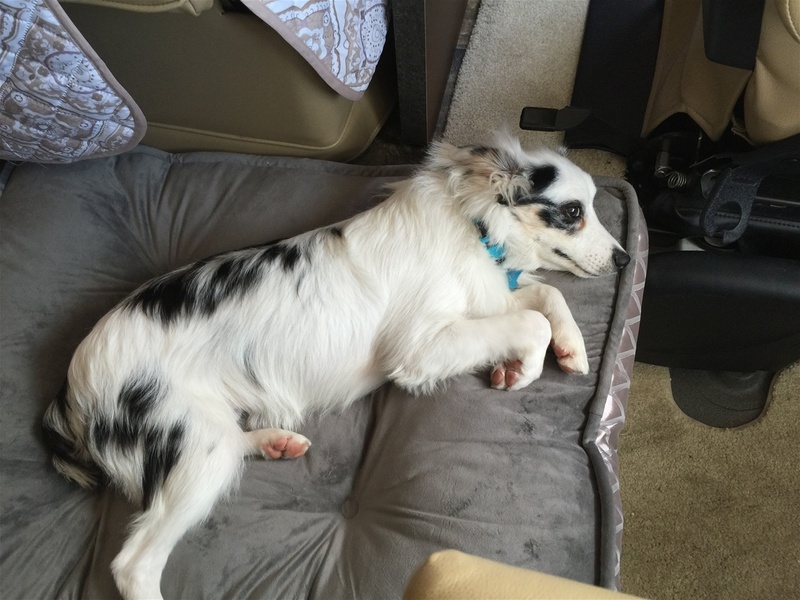 I am overflowing with excitement of no more driving for a few days…so far we have ridden in that RV for 2004 miles. Mother of pearl! 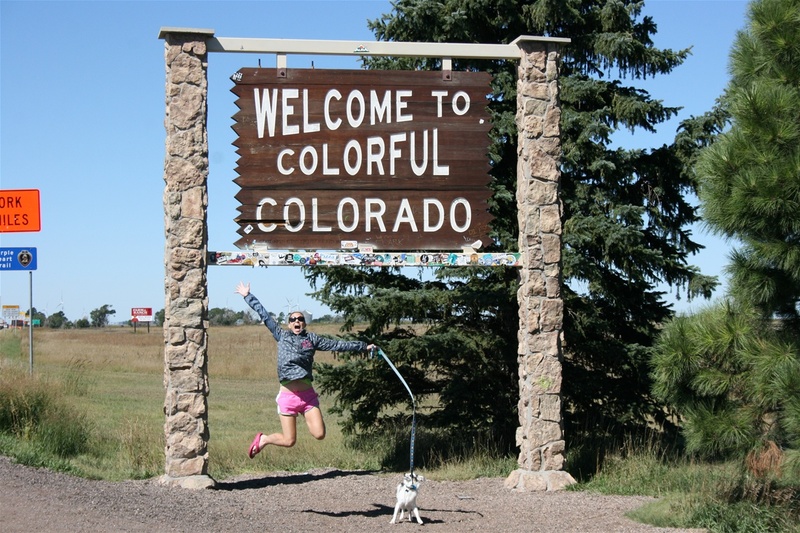 Crossing into Colorado was the best feeling, but then quickly my excitement vanished when I began to realize that all of the towns we were passing through were without treats. No Dairy Queen, no Sonic, no roadside boiled peanuts, no homemade fudge, no nothing – completely treatless! That is part of the fun in a road trip and it had been snatched right from me! As the tutus pointed out when we were discussing this on our thread – you would think the “munchies” would be very prevalent in towns located in Colorado, and treats would be much easier to locate. This could be someone’s big business opportunity! Marley has been so amazing these past few days then today, the unthinkable happened. He had what appeared to be a full-blown panic attack and for the last hour of the drive he was freaking out and suddenly became obsessed with Mike and his every move. Then Mike and I started to panic because the dog was freaking out and because we started thinking how they say animals have the sense of knowing something is about to happen to someone. I then started my triage of questions: Do you feel ok? Are you having shortness of breath or chest pain? Do you feel weak or feverish? Are you slurring your words, have a headache or is your vision changing? Mike apparently was feeling just fine! We then arrived to our destination in Loveland, CO right outside of Boulder! I am so excited to have electric hook-up, water, cable and Wi-Fi tonight. I will miss the rest stop along with limited water use and the potential for being attacked by some serial killer (don’t watch Criminal Minds). We are now relaxing at the picnic table and Marley seems back to normal, thank goodness. I guess we are going to have to consider doggie valium for the rest of the trip! We plan to take a nice walk over to Buffalo Wild Wings for dinner (I will be having a salad!) since they have outdoor seating so Marley can join us. We will all sleep good tonight and tomorrow looks like a very fun-filled day of sightseeing and running (hopefully some shopping!). I have never been so happy to see a state sign! Oh glorious day! I have spent more time in the kitchen on VACATION than I do at home! It was another long day on the road, simply going from point A to point B in the journey to our first real stop in Boulder, CO. Scenery has started to improve, but mostly farm land and some amazing windmills spotted on today’s journey. 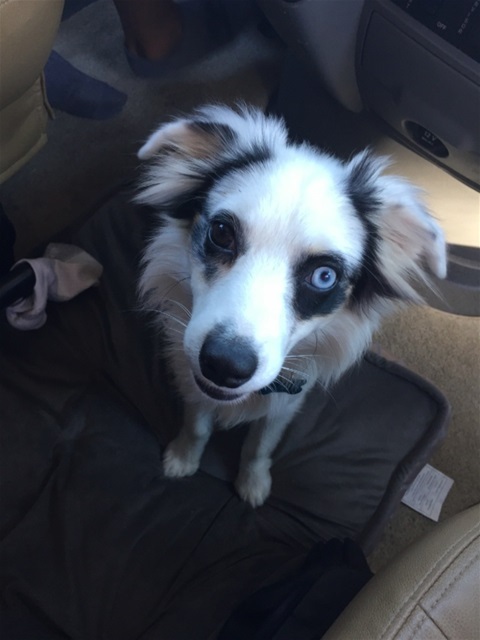 Marley has been amazing, especially since we made a little pit stop at Petsmart for some yummy bones and great chew toys that are much more delicious than the seat belt cover and other various parts of the RV when boredom hits! 1. All 3 of us enjoyed a 3 mile run this morning before leaving. The hills made it feel like a 13 mile run…I have a feeling running in Colorado will be slightly painful and not flat. 2. Mike drove right past the mall in Dallas, without blinking, without caring or even without offering, “Sonya, want to stop for an hour and walk around and stretch our legs?”. Nope! He just kept on going! 3. Dallas traffic was a nightmare and nothing like I envisioned. My image was based off of the television show I loved so much, “Dallas”. Nothing like the show – nothing! 4. We found the best gas station (or “travel plaza”) EVER, complete with a dog park! Marley was able to play Frisbee and run around off the leash for awhile. At this stop we enjoyed our picnic of pulled pork sandwiches and chips – gourmet RV’ing at its best! 5. Marley and I took a 2 hour nap in the bedroom while Mike drove. This may not seem like a highlight, but it was for me! It passed two hours – when I woke up we were in Oklahoma! Mike also enjoyed some quiet time – not that he really needed it because he loves talking with me for 8-10 hours nonstop. 6. Marley almost died! A can of chicken broth barely missed whacking him in the head, as our driver somehow missed a giant pothole in the gas station parking lot causing pantry doors to open and food fly out in every direction. 7. I threatened to find a new driver (this is only day 3 remember!) when even after the above incident he recklessly made a fast turn causing the refrigerator to open and a container of fresh pineapple spill all over the floor. 8. Navigating a wind storm as we entered Kansas. There was a travel advisory regarding high winds! Couldn't even pull over to get picture of state sign... as if we were in the middle of a tornado. It was CRAZY! 9. Last but not least we are enjoying another beautiful night under the stars at a spectacular rest stop in Kansas. Another day has come to a close! It started quite early this morning, but luckily we are a traveling house on wheels so I can stay in bed while Mike drives. It was sad to leave the beautiful rest stop and the truckers but it was time to move on down the road! 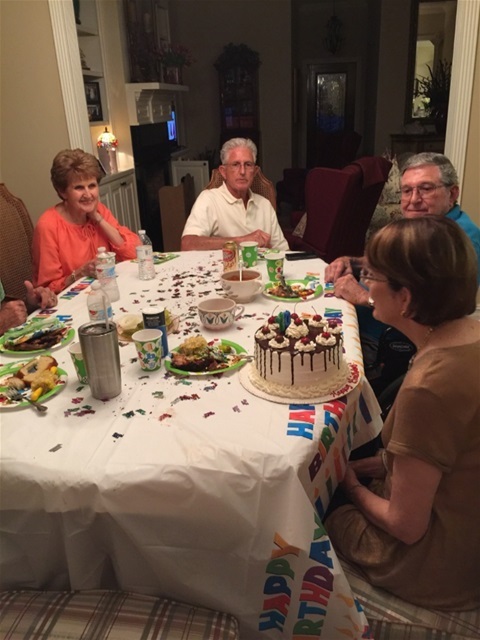 We drove through Alabama, Mississippi and landed here in West Monroe for a short visit with family, to celebrate my Mom’s 70th and take a bath in a full-size tub! The scenery was just as exciting as yesterday with the highlight on the road today being crossing the Mississippi River Bridge. West Monroe, however, is a small town everyone needs to experience at some point in their life. Nowhere else will you see the rebel flag flying high on houses and trucks regardless of race (it is after all home of the West Monroe Rebels), a church on every corner, a gun rack as standard equipment on trucks and drive-thru daiquiri and liquor shops (pronounced “licka”). It is also home of Duck Dynasty, so that should pretty much tell you everything you need to know about the people you will meet in West Monroe. Time slows, high school football is very serious, the Southern drawl is thick and everyone is related to someone who knows someone who knows my family…a trip to the grocery becomes a tortuous dissertation about “how proud my momma is of me” or “wow, Florida must be so exciting” or “what are your plans for your visit”, expecting a minute-by-minute run-down, and then they will tell you about their plans too! Bottom-line, avoid the grocery or Wal-Mart at all costs! The real trip starts tomorrow as we head to Boulder and the true adventures begin! However, I must say the adventure is pretty intense here in West Monroe and a “lagniappe” (**see below) for this trip! 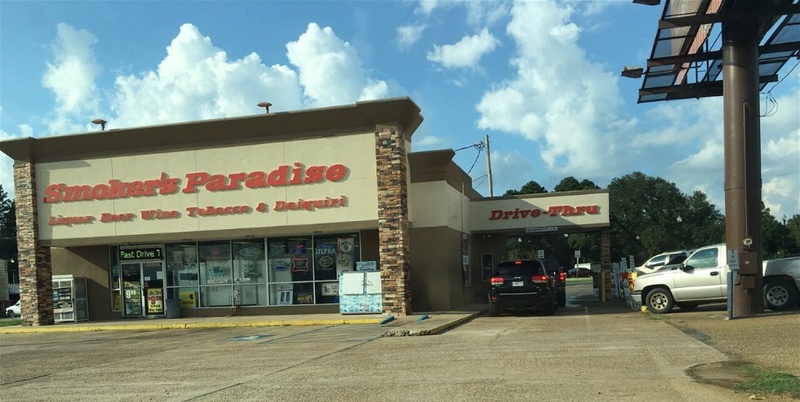 Where else can you find a local business named “Bayou Butts and Booze” or get your alcohol on the go? It’s always sad to leave my family, but I will drown my sorrows in a chocolate sno-ball (not to be confused with shaved ice) topped with condensed milk from Debbie’s Sno-Balls on the way out of town! Goodnight and don’t let the chiggers bite! The word lagniappe is defined as: a small gift given a customer by a merchant at the time of a purchase; something given or obtained gratuitously or by way of good measure. This term entered the English language by the Louisiana French adapting a word brought in to New Orleans by the Spanish Creoles. It is derived from the South American Spanish phrase la yapa or ñapa (referring to a free extra item, usually a very cheap one). It became customary to ask for a lagniappe when making a purchase. The seller usually responds by throwing in a little extra. Although this is an old custom, it is still widely practiced in Louisiana. Street vendors, especially vegetable vendors, are expected to throw in a few green chili peppers or a small bunch of cilantro with a purchase. A dozen donuts, usually contains a 13th! There is even a line! The journey began today and we hopped on the rig, said a prayer and started down the road all excited for the first few hours of our road-trip! We chatted, played some Bible trivia, listened to music and had coffee… passing the time on the road would be a blast, with all that entertainment I just knew we were close to Tallahassee! Well, it surely seemed like I had passed more time than 3 hours, but the sign welcoming us into Ocala verified that I would have to work a little harder on entertaining myself! Luckily a roast was cooking in the crock pot so the anticipation of a fun dinner picnic kept the momentum going! 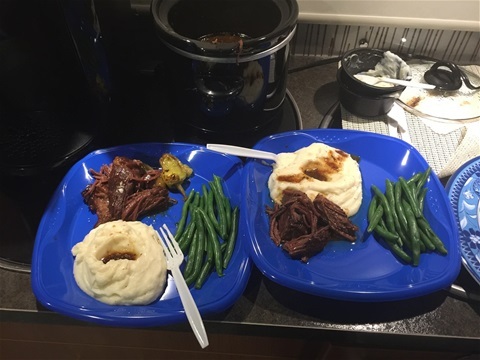 As expected the dinner picnic was a delight as we ate on paper plates in the parking lot of the Flying J gas station – but, hey, have you ever enjoyed delicious roast, mashed potatoes and green beans at a gas station? With a few hours left of driving and Marley becoming quite bored we questioned how this was really going to work...but being the think-ahead dog owner that I am, Marley was offered a treat with a hidden jewel (mild sedative per the vet to ease travel anxiety) and as he began chewing on every part of the RV, he was suddenly overcome with the need to take a nap! We have now arrived at our first stop outside of Pensacola…a quaint spot with 24-hour security, well-lit and with level parking… the rest stop! So our first day comes to a close, right here alongside some wonderful truckers! Tomorrow we head to the big town of West Monroe and spend a little time with my family before really hitting the wide open spaces (Yes, there is a song by that title, which I Iove!). This seems like a rather shady start but you know it can only progress upwards from here! Look closely! The driver's seatbelt now looks a little damaged...boredom at its best! The journey begins today....not in white pants (we hit the road after Labor Day)! For 2 years my adventurous, outdoors-lovin' husband has been thinking and planning this adventure! 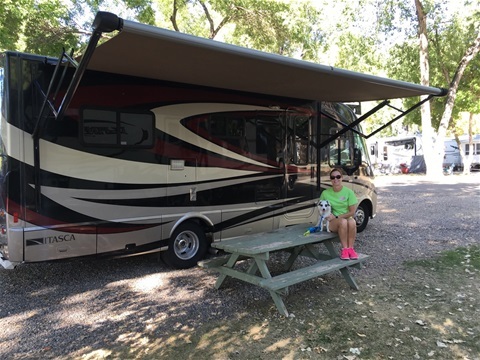 It started with the dream of our own RV, which was planned for retirement years...BUT why wait, we are after-all in "pre-tirement" and know nothing about motorhomes, so we took the plunge! I'm not sure how I didn’t understand the septic thing but I thought you flush and it went out, somewhere! If you didn’t know, you have to hook-up the waste hose and "dump" it! All I can say is buy disposable gloves, hand sanitizer and stay inside while the husband handles it! We practiced RV’ing last year and feel pretty confident...I mean, we did go as far as The Keys, a whole 3 hours away, so we must be ready to travel from South Florida to the West Coast and beyond, right? A whole month..no cell phone, well, at least not every day, reading, lots of running and biking and mostly enjoying some breathtaking scenery! Oh and one last tidbit for this adventure...I brought home a puppy in May! Surprise! An unexpected passenger is now joining us on our quaint RV for a month! It will be a BLAST, especially for my husband the full-time driver… but no worries, I have plenty to talk about…I’m sure he will enjoy all 30 days of my conversing! !